Zac is a Senior Partner at The Future Project, where he has served as Chief Operating Officer, Chief Innovation Officer, and Director of The Future Lab. Previously Zac was a Lead Game Designer for Magic: The Gathering and a Research Affiliate at the MIT Game Lab. The best answer I’ve ever seen to this question is contained in Erin Raab’s Ph.D. thesis from the Stanford School of Education (https://searchworks.stanford.edu/view/12266098). I can’t do the thesis justice — it’s extraordinary — but the gist is that you have a two-by-two of education’s historical purposes. One axis is “Intrinsic/Instrumental” and the other axis is “Individual/Collective”. It’s important to note that this isn’t made up, but is actually based on a historical analysis of distinct theories and practices of education. 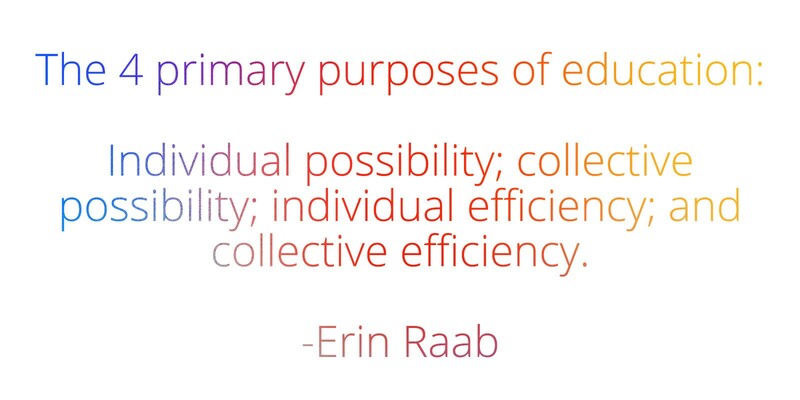 What this means is that you really have four primary purposes that I’ll basically call individual possibility; collective possibility; individual efficiency; and collective efficiency. These are Erin’s terms. The first two essentially relate to the development of a person and their ability to function in social/group contexts; it is essentially about the ceiling-maximization and essential learning experience of people in different environments. The second two, by contrast, essentially relate to both the individual and collective’s interest in achieving purposes by virtue of the process of education. The individual wants to maximize his/her economic/performative potential, and society has an interest in ensuring that its essential roles are capable of being filled. What is important is that all four of these purposes represent the legitimate interests of different stakeholders and will be present at all times. At various points in history, however, different aspects have been emphasized to different degrees, and most conflicts about the value/nature of education typically result from different stakeholders prioritizing these different outcomes differently. There are of course numerous valid arguments about how each ‘bucket’ can and should be weighted. The important thing is to realize the nature of the playing field — because when you don’t, you often find yourself talking past someone else, unable to resolve the dialogue. The journey of being alive is to a large extent the journey of figuring out how to set goals and intentions that are a function of what you believe is true — and what, by extension, you value — and then being able to follow through on those goals and intentions in a way that doesn’t create second-order problems. 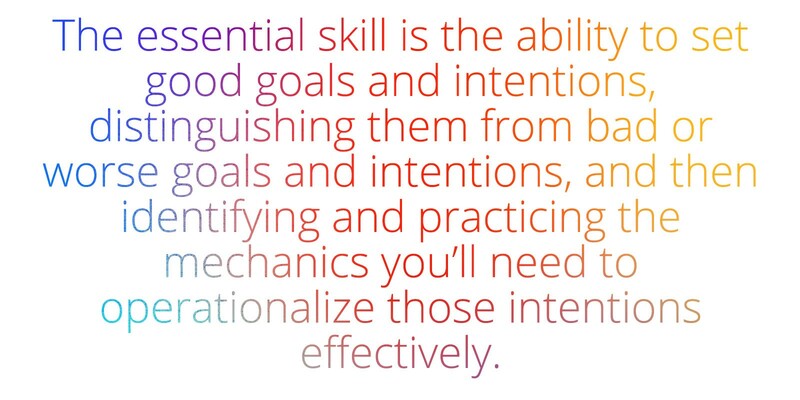 Therefore the essential skill is the ability to set good goals and intentions, distinguishing them from bad or worse goals and intentions, and then identifying and practicing the mechanics you’ll need to operationalize those intentions effectively. This is because you’re not going to set goals/intentions if nothing matters to you or you don’t feel as though it’s meaningful/purposeful/valuable/important to pursue or accomplish anything. This effect is magnified if you want to set goals/intentions, but you don’t believe pursuing/accomplishing anything that matters to you is actually possible. For people who have experienced trauma or oppression, often the ability to do this represents a fundamental psychological shift that is in itself a long and arduous journey (in other words, not just a question of ‘education’). But it’s also about things like being excited and engaged and curious and present — the kinds of things that make life seem and feel worth it. Identity is a tricky word because it seems super individualistic, but it’s worth noting that we almost always define identity through our participation in collective experiences: nationalities, ethnicities, communities of fandom (sports, games, TV shows), regions, preferences, and values (it turns out there are only about 9–10 real domains of values, or ‘motivational goals). The possession of an identity is what allows you to distinguish what all humans could pursue versus what you want to pursue, and it’s usually revealed by the kinds of things that cause you to feel strongly — even if you don’t know why. Identities are reinforced through the practice of some things to the exclusion of other things. Note that ‘pursuits’ here don’t have to be instrumental; they can be experiences, states of being, etc. Obviously, actually reaching a goal or practicing an intention occurs proportionate to the efficacy with which one is able to enact an goal or intention once it’s set. Knowing about a thing will allow actions to better approximate strategic rather than random intention — contributing to efficacy — whereas having more skill at a thing is going to ensure those strategic actions actually achieve their intended purpose. Fourth, and finally, you need to be able to reflect on the application of knowledge and skills to the goal so as to calibrate what you might need to understand or do differently, and to understand how much progress you have or have not made. This again isn’t just about intellectually analyzing some subject; this is about mitigating enough insecurity within oneself to accurately see and interpret reality without retreating into self-preservation. 3. What problem in education do you most hope to see solved? There are two things I think are extremely important. The first is the following: as a business owner, I view it as my responsibility to hire the talent I need to be successful. As such I am incentivized to construct proprietary methodologies to assess, sort, train, develop, and support talent better than my competitors, and rightly incur substantial cost through doing so. What I don’t understand, then, is why so much talent-curation/ranking/sorting is outsourced to the secondary and post-secondary education system in the form of obsessive grading, test-taking, ranking, evaluation, etc. It’s both redundant — in that subsequent screens are going to be conducted anyway — and inefficient even despite the redundancy (since the information-density/evaluative heuristics/etc. are going to be only tertiary related to my specific needs as an employer), not to mention that I have no reason to trust the evaluative capacity of everyone involved in the chain. Meanwhile, a giant externality gets imposed on the people both doing the evaluation and being evaluated. For the people doing the evaluation, they are spending a bunch of time developing and executing upon a competency that they, as teachers and managers of teachers, should not be expected to have. For the people being evaluated, they experience the tremendous psychological cost of being semi-arbitrarily stack-ranked along semi-arbitrary criteria from a very early age, and incurring the considerable stress of making decisions well below the established age of consent that will affect the trajectories of their entire lives. A superior system would, like most other business, conduct periodic low-obtrusiveness quality-assurance testing coupled with effective management of the input processes themselves. The second thing is that education is structured around factual content. Ignoring the bigger problem that none of the content-selection was derived backwards from the four purposes of education above — and therefore has no reason to be assumed to work when it comes to advancing those purposes — the value chain addressed in the previous question reveals that factual content is only one component of one aspect of the ideal value proposition of education. That content is important, in that it does indeed represent a portion of the value chain, but the content is only valuable if more fundamental issues of hope, belief, identity, and skill have been established. This leads to other second-order problems like e.g. political discourse primarily discussing the content of position statements as opposed to the approach one would take when making decisions or the objectives one attempts to attain at the level of the citizen or the nation. 4. What about education works well and should continue? Elementary education, and specifically literacy education, are very good. The problems tend to arise concurrent with the challenges of adolescent development. 5. Why did you join The Future Project? What did you hope to achieve? The purpose of my life has been, and will always be, to connect people with their greatest possibility such that they can discover and pursue the fullest versions of their lives. I’d previously been addressing that question in instrumental ways — creating art; creating literature; creating games; enacting policies; writing articles and criticism — so when I found an organization whose mission was my ordinal purpose, it was too dope of an opportunity to pass up! 6. Where does The Future Project belong in the current education system? Is it a supplement, alternative or replacement to the status quo? I like to think of TFP as a ‘skin’ that can be applied to any educational institution to help it center on a vision of what’s possible; a ‘tone’ of engagement with everyone in the building; a vessel of common purpose; and the introduction of new approaches (e.g. passion, purpose, inspiration) that always have a place in school but are often not emphasized. The stack of research which exists to support this certainly helps! 7. Why is difficult to change education? What have you learned since entering the field? This is analogous to the fleet of cars on the highway, which have about a fifteen-year life cycle; even if you had driverless cars that could hit the road flawlessly tomorrow, it would take well over a decade for the norm to shift. 8. Who is one historical or public figure (alive or dead) that you admire and why? Angela Davis, for being one of the world’s foremost cross-sector social and intellectual innovators. 9. 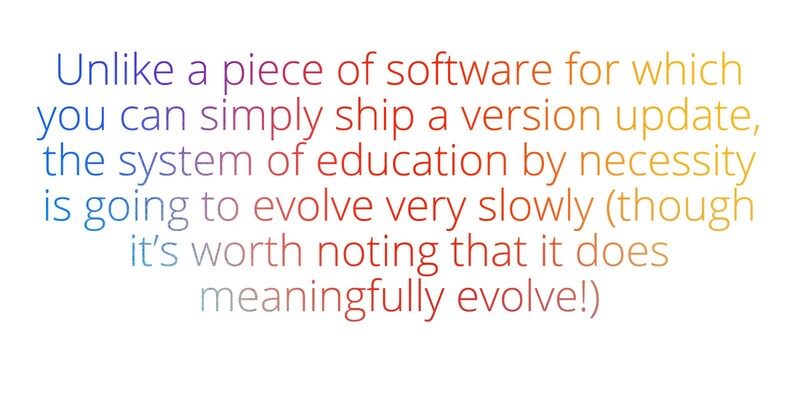 What does the future of education look like to you?